It is one of signature dishes of Kerala where every mom has its own version of it. 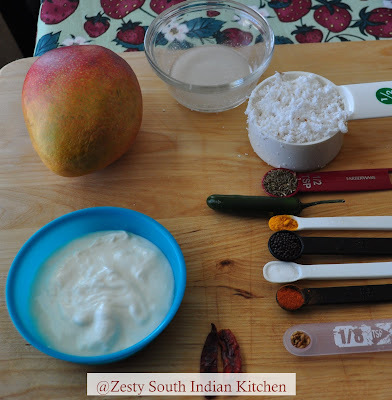 We can make pulissery with cucumber, raw mango, papaya, taro root etc. 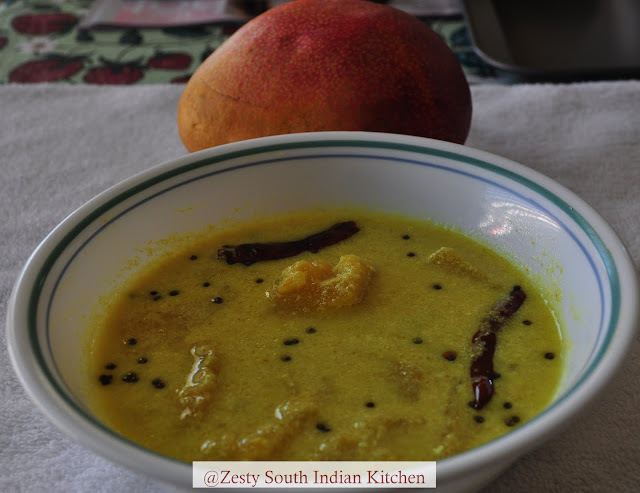 In my home, amma used to make pulissery with ripe mango, plantain and pineapple. If you give me a choice of vegetable or fruit pulissery I will select fruit pulissery, because it has sweetness of fruit, tanginess of yogurt and spiciness from the chilies used. March, April month is the mango and jackfruit season in Kerala. Most of the home with backyards in Kerala has at least one mango and jackfruit tree. At Appa’s home there were two Jackfruit and mango trees (mangoes from one of those tree was used to make pickle), other to eat ripe. After school, the main sports event for the neighborhood kids was to throw stones at these mangoes on the trees to make them fall to the ground. At times some of the stones would miss the mangoes and instead hit the roof causing damage. On most days my grandma will stand and guard near the mango trees after school time was over. Some time crow’s also make mess with ripe mangoes. Usually during these month, every dish my grandma make’s will contain either mango or jack fruit. She is one the best cooks that I have seen. Last week when I went to Wal-Mart, mangoes were on sale at two for a dollar. Nowadays vegetables price have sky rocketed, onion’s without which I can’t even cook of thinking was 99 cents per pound, and green bell pepper 89 cents each. I had never ever seen prices this high for onions or bell pepper. Finally I got the two mangoes and after coming home, decided to make my mango pulissery. Grandma and amma makes this dish with 4-5 mangoes, however, here I used only one to make a small quantity. Here comes my amma and grandma’s recipe. Peel mango and remove the skin using a vegetable peeler or sharp knife. Chop mango into bite size pieces. I like to keep some flesh with mango seed and I will use that also. (I love to eat them in the curry, my hubby hates them). Boil ¾ cup water in sauce pot and add chopped mango pieces and seed( If using), turmeric powder , Chili powder and salt and cook them until they become soft not mushy,( it takes about 10 minutes ). Mean time grind grated coconut with Green chili and cumin seeds and water to form a fine paste. Add the ground paste into cooked mango pieces and boil for another 3 minutes or you see small bubbles coming in the top. Lower the flame and beaten yougrut and let simmer for another 2 minutes without letting them boil. Check salt and spices and switch off the flame. 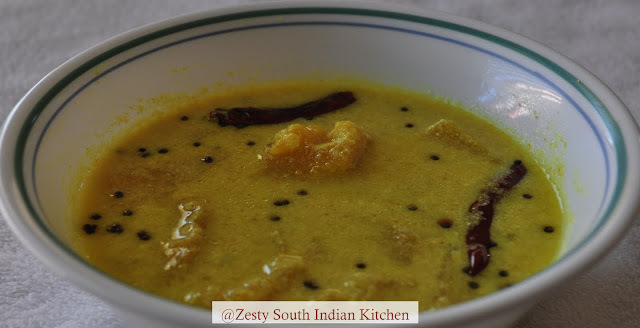 In a small pan heat coconut oil and add mustard seeds, red chili halves and fenugreek seeds, once mustard seed starts spluttering remove from the fire and add to cooked mango pulissery. wow. looks awesome and sometimes i made with pineapple. The pulissery looks yumm, perfect delight for summer, will give it a shot sometime. Enthaiyum favorite.ethra kazhichallum mathiyavilla.nice pic! Dear,Some awards waiting for u…Please visit my blog and collect it. never used ripe mango in any of my dishes…something new and different but surely a good one..
Wooow,,looks perfect n yummy,, i hv nt tried this recipe yet ,,sure will try once soon.thanks for sharing dear,,take care n keep on smiling. Slurppp mango pulissery looks incredible…awesome click..
we make a similar kadi called AppeHuli, but without yogurt. Need to try this one. this looks so mouth watering..anything with mango and I am game..
My Fav!!! looks so yummy!!! My hubby makes it and I simply love it! Looks really tasty and yummy.. Awesome, awesome and awesome. Loved ur write-up, those days were real fun. Can imagine the scene. I like mambazha pulissery as it combines all the tastes in a single dish, urs is too good. I like it ,I love it.